okay, i was on twitter just now and someone shared a link to this article on Tumblr. not an article i guess. it's just a post by a Chinese-Casie(maybe). Cassiopeia has to read this! don't care if you're a stan or hater, hope that you can think about this thoroughly. no war please. just read and think. -Back then HoMin only thought about protecting the “DBSK” name. At the beginning of the court case, many of SM’s groups were still very new. SM still doesn’t have a group that could replace DBSK just yet. - Right now, SM is probably using this method: They are using HoMin’s popularity to earn more money to spend on their other groups and to debut new ones. They are using the least amount of money on HoMin while still exploring and exposing HoMin’s greatest potential. I mean, SM could really have concerts for HoMin to perform in right? So why aren’t they producing tours for them? SM also understands this clearly.Many go to the lives just to see TVXQ (HoMin), the red ocean in Tokyo Dome is self-explanatory. The news reports never properly credited them for their efforts. So those of you who did not attend the live show (I believe that she’s referring to Music Bank in Tokyo Dome)would naturally believe in what KBS said. First they [SM] would not talk about HoMin’s popularity on TV, so that the Korean fans would slowly believe that their idols are not popular anymore, and when they’re introducing TVXQ, they would just say it quickly in one take. The goal? It’s to let TVXQ’s popularity and dominance to quietly fade away. Do you still not see it? They’re banning JYJ because of the lawsuit, but they’re also quietly blocking HoMin because they want to debut and promote newer groups (who in turn, will help SM earn even MORE money). IF one day, there might be a group that have reached TVXQ’S status,who knows? SME MIGHT REALLY KICK HOMIN OUT. THey will single-handedly pull down TVXQ.Whatever they said about “picking out the best of the best to form this group” and “we invested a lot of time in to them” will all be rubbish at that point.SM ONLY CARES ABOUT HOW MUCH MONEY A GROUP CAN EARN THEM RIGHT NOW. THEY DO NOT CARE ABOUT HOW MANY #1’S THAT GROUP HAS EVER ACHIEVED . ONCE THAT GROUP LOSES THEIR POPULARITY,THEY WON’T CARE ABOUT HOW ‘LEGENDARY’ THE GROUP WAS BEFORE. AS LONG AS THE GROUP STARTS TO EARN LESS MONEY FOR THEM,THE GROUP WILL BE TRASH IN SM’S EYES.Remember the legendary H.O.T? Weren’t they the top group back then? And then what happened to them? The Fourth Album came out on September 24, 2008. They also went on the Mirotic tour around the same time. They spent about 5-6 months advertising this album. They also came out with the 4th Japanese album during their Korean promotions.They came out with The Secret Code on March 25th.HoMin’s come back album was released January 5, 2011. Didn’t you guys think that DBSK was SM’s money tree? I also thought like that too.The two years and three months were surely enough time off to make sm go crazy over money right? So crazy that they can’t wait to produce a concert for Homin to earn more money? So why aren’t they doing it? If you count from the fourth album till now, that’s already MORE than 6 months. Isn’t it the perfect time to hold a concert now? But why is it that SM doesn’t seem to care about earning more money that way? And why are they still spending MORE money for Homin to go on shows to advertise? Also, why didn’t they first release a KOREAN SINGLE and THEN release a Japanese single after a month or two? Instead, they released a fifth album for both Japan AND Korea in the same month. If sm says that it’s to keep their popularity up in Japan, then I want to say one thing.According to SM’s way of doing things,shouldn’t they release a new single then promote it with a tour? Isn’t that the most direct way to promote the new single?They’re extremely popular in Japan, there’s no doubt about that. If I remember correctly, AREN’T THEY THE FIRST KOREAN ARTISTS TO STEP ON THE TOKYO DOME STAGE AND HOLD A TOUR THERE? Actually, SM doesn’t even worry about their popularity in Japan. So why would they release two albums at once? Maybe I thought of this a bit before the time when Changmin was injured. I always felt that JYJ’s departure would leave SM wondering if they (SM) did the right thing or not.I was so naive that I even believed that SM would treasure the current DBSK.But what really happened? Yunho’s leg got injured, remember?How long ago was his injury? Yet there are still scars of it.It must be such a deep injury that even after such a long time, it still hasn’t healed properly.They said that it was a “light” injury, but it still had to be wrapped. As far as I know, only BONE FRACTURES need to be wrapped as well as ligaments. If it was a ligament, then external heat would’ve healed it faster. Anyhow, SM has not been clearly explaining about Changmin’s wrist injury. I just want to say that we are NOT experts, but we can still ANALYZE THESE TYPE OF THINGS. When they were a five membered group, why do you think they stayed in SM and experienced all that was mentioned in Yoochun’s song? Easy. It was for us, fans and for the members themselves. If homin left too, then we would never be able to scream out the name “DONG BANG SHIN KI” out to the members. I always thought that HoMin were at a safe place, and that SM would change their ways. Yunho and Changmin look like they’re having it easy, don’t they? But really, they have many many responsibilities upon their backs and many tears that they’re trying to hold back. It is easy to realize that the five have gone through many obstacles during this period. Yunho forced himself to who knows what level in order to skate perfectly on Kiss&Cry.Falling down and then getting back up and then falling and getting up again.After skating practice, he has to go up on stage and put on a perfect singing and dancing performance. I think, that it might not be what he wanted to do? Being the leader IS that difficult.When they go on shows, he has to say a few things. Even if they’re just a few words, he has to constantly remember and practice in his head what to say, and whether or not it’s suitable to say it. CHANGMIN. Think of how hard was it for him to wear a cast in such hot weather.That’s all we could see, as fans, but really how much pain has he had to endure? How many times has this happened before? Changmin is speaking less now. Many people will argue that he speaks more NOW than when they were a 5 membered group. I noticed that one time on a show, all he did was just smile.Maybe what they were saying were really that funny?He’s really simple. So simple that he just wants to stand on stage and sing. YOOCHUN- Why do you think that he felt the need to write “Untitled Song”? ( I’m not sure what she put here since I really don’t know that much chinese) When this song came out, SM blocked JYJ even MORE.He wrote this song and expressed all the painful experiences they had during the 7 years together as a debuted group. A 7 minute song that expresses to us how much pain they had to endure. Sungkyung kwan Scandal, the first drama that you starred in, but you weren’t able to promote properly. In the end, you prevailed and was awarded. JAEJOONG- was forced to personally contact their sponsors for their concert tour. He had to endure all the insults and criticisms for whenever he mentions anything about missing DB5K and for changing his twitter to “JYJ from TVXQ”.He loves them so much. He loves them so much that he even says that the songs he wrote all belong to the five members of TVXQ or at this point, he’s not afraid anymore.Actually, they can all stand on stage together. Even he said that he never thought that he would be blocked from promoting in his own country.All he could do is upload pictures of Jeju island on his twitter while carrying many sorrows in his heart. JUNSU- The most innocent and honest one. Like Changmin, he quietly completes his work.Do you all still remember the time when a group of anti’s were deliberately attacking him on twitter?He’s so innocent and helpless.It breaks my heart, but I never know what to do for him.Even if it’s just a practice session he’s a perfectionist.You all don’t know what happened. Junho stopped promoting in Korea, so there was Japan left.Why do you think he stopped promoting in Korea?Hey, you anti’s can’t even leave his brother alone!Then afterwards, all Junsu could do was say very poetic but very depressing things. THE FIVE: Ever since their debut, they’ve fought for their dream.Fighting for that one ending that they all dreamed of.There’s always us (Cassiopeia). Without us, they would not know who to sing to.They don’t seem to say that because of us, that they’re very happy anymore.At this moment, I don’t hope for anything complicated. I just hope that they are all very well. Maybe they’ve all found their own reasons? As for me, I haven’t found a reason just yet. All I know is that I still love them.I already said to myself that “If they are not TVXQ, then they should just be Kim Junsu, Kim Jaejoong, Jung Yunho,Park Yoochun and Shim Changmin.Maybe that’s how mysterious my heart is? I can accept the entire world, but yet I can only accept the Five of you. i cried as i read this. how about you? have you ever think of all of this? 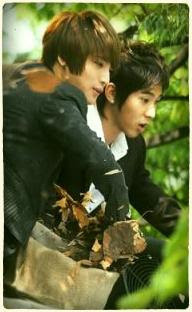 Cassiopeia is for them. without us, they will not as strong as now. and Cassies, why became seriously selfish nowadays??? did you know everything and every single things deep inside their heart when you're bashing JYJ or HoMin? that wasn't Cassiopeia is all about! Cassiopeia is all about getting together and support 5 of them! not just two or three of them! sometimes, i miss the old Cassiopeia. whoever you are right now, stans or haters, i believe that you're once part of Cassiopeia. why changed so much??? don't be so selfish by only think about what you want and how you feel without even think about how the boys are feeling! i'm so proud of some fans that still love all 5 of them. never give up will you? keep on praying so that they can be together again. there'll be no a fandom called as CASSIOPEIA that is where you're standing now!